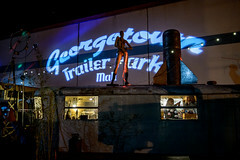 Georgetown Art Attack on June 11! Art, Music & More! Don’t miss the Georgetown Carnival: Art Music & More. Free fun for everyone. Fantagraphics Bookstore & Gallery presents Down to Clown with Tatiana Gill featuring original artwork from her new clown coloring book and other works. Patrons are encouraged to color pages from the book to include in the exhibition. The artist will be in store at the Georgetown Carnival from 4:00 to 6:00 PM to sign copies and encourage coloring contributions. Festival Street Stage located on 12th Ave. S. is featuring the SANCA Acrobats, Seattle Drum School, Eagles Aerie Brass Band, Lisa Prank and much, much, more!!! Bridge Productions is excited to introduce Chicago-based artist Krista Svalbonas‘ first solo show in Seattle, Topophilia, this coming June. The primary focus of Topophilia is her highly acclaimed Migrants series – a body of smaller photography and collage works in which Svalbonas investigates notions of time, place, familiarity, and displacement. Her new work, the Migrator series, is a set of bas relief constructions breaking slightly free of the wall to further her exploration of dismantled and rearranged architectural features. 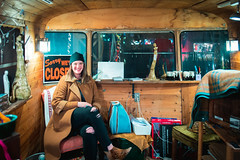 Rainier Glass Studiowill be open during the Georgetown Carnival with live glass blowing demonstrations and exhibiting a full array of beautiful and unique blown glass art pieces by a variety of northwest artists. Come get inspired! Miller School of Art is hosting a group show during the Georgetown Carnival. Come explore the creative spirit in the historic setting with many talented artists and their teacher. Krab Jab Studiosis exhibiting The Art of Tenaya Sims. June 11- July 2, opening reception on June 11th 6-9PM with artist in attendance. From the elegant graphite sketches to the soaring oversized oil paintings, Seattle artist Tenaya Sims debuts his new work of epic proportions, with themes surrounding the mythological views of women in art. The result is richly engaging and utterly breathtaking. Eight and Sand Open Inventory Salon Show. This month during the Georgetown Carnival, Eight and Sand will be displaying all of the current open inventory of artwork in a salon style show. This will be an off the wall show where you take the piece with you when you purchase, no need to wait a month for pick up! Many different artists will be represented. Hours will be from 1-7pm. Equinox Studios will be a show stopper at the Carnival with their zany madcap interactive art! From catapult powered painting craziness to raku ceramic rowdiness and the Iron Monkeys black smithing madness. 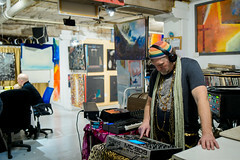 Come try it all, make some fun and be part of art with Equinox Studios! studio e presents SHORT STORIES: Tim Marsden. Opening reception Friday, June 10th 6-9pm, exhibit runs June 11- July 2.With this body of new work, Tim Marsden uses a multi media approach to create an installation that explores visual narrative. Traditional mediums of drawing, painting and sculpture are used to create elements that range in size from the intimate sculptures to large-scale murals. Each of the pieces work together to ultimately create an overall narrative within the space. All City Coffee is showing solo exhibition from Portland-based illustrator, artist and educator Bryan Rubnis B-Sides & Remixes, featuring new prints and previously unreleased drawings, paintings and studies. A long time friend of All City, Bubnis has collaborated with a number of commercial clients and agencies and his work has been exhibited across the U.S. and abroad. Fantagraphics Bookstore & Gallery is pleased to present an exhibition of original drawings from Australian artist Simon Hanselmann‘s latest comix collection “Megg & Mogg in Amsterdam and Other Stories. Bridge Productions is delighted to present Seattle artist Julie Alpert‘s solo exhibition, Garbled Love Letters, featuring of three large pieces in painting and collage from her Bows and Drips Each piece overflows with colorful bow-ties, ribbons, and bursts of pattern; literally dripping with bright paint and ornamentation. Also featured is an installation of small, intimate watercolors floating across the length of a wall, pairing loose, airy, asemic writing and rhythmic repetition; articulating nonsensical language and playful patterns, as well as invented and actual symbols. The Hammie Salon is featuring Six Photo Stories by Brenda J Pederson. Brenda J Pederson is a travel and food photographer, based in Seattle. No matter what the subject, her goal is to capture the essence of a time and place to share with you. This exhibit highlights selections from a new project, Six Photo Stories,combining photos and text into peek-a-boo views of cultures and places. Interstitial is exhibiting Jueqian Fang, Orchids That Look Good in Bad Lighting. Orchid Board – Most Complete Orchid Forum on the web ! > STYLES, SETUPS & ENCLOSURES > Growing Under Lights > Affect of Artificial Light on Orchids. “The reason that non filament lighting sources do not get a 100% CRI rating, is that they are made up of specific salts, which ‘burn’ at different specific colors, they add all these colors up and get something approximating ‘white’ light. This can be good or bad for plants…Although it seems we would want a filament bulb because it has a linear spectrum (all color equal) unfortunately filament bulbs are very wasteful.” – Jueqian Fang. Exhibit runs thru May 22. Rainier Glass Studiofounded in 1994, bringing fine art, beauty, and a one of a kind experience. The Rainier Glass Studio features a large scale hot-shop with four glory holes; available for classes, private events and “Blow-Your-Own” Glass Activities! Browse thru the Gallery’s unique array of blown glass art pieces by a variety of northwest artists, watch the live demonstrations and get inspired to reserve blow-your-own lessons! Miller School of Art featured artist, Heather Danso lovingly explores in acrylics, working on both sides of loosely woven canvas, creating portraits and abstracts that explore expression, identity, and the possible. Krab Jab Studiosis exhibiting Rituals: The Art of Sara Winters and Cynthia Sheppard. Celebrated illustrators Sara Winters and Cynthia Sheppard present their two-woman show, Rituals, which is a visceral exploration of deep-seated thoughts and emotions that tend to repeat themselves, expressed through paintings of sacred objects and the performance of ceremonies. All work is in traditional painting medium. Opening on Saturday May 14, 6-9pm. Artist talk with Sara and Cynthia in attendance at 7: 30 pm. Mainframe presents Back+Forth an installation of kinetic/interactive sculpture by Seattle based artist Roger Feldman. Viewers are invited into a position of power where non-committal talk meets political rhetoric. This piece first appeared at the LA Municipal Art Gallery, Woodland Hills and has been reworked by the artist for this exhibit. Roger Feldman is an accomplished artist working in large scale site specific installation and sculpture, exhibiting nationally and internationally including the Tacoma Art Museum and Suyama Space in Seattle. Grand opening and artist reception Saturday, May 14, 6-9pm. Praxis Arts is happy to exhibit the works of Nikki Frumkin. 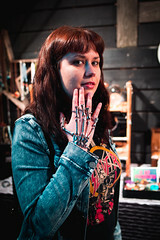 Nikki is an artist inspired by hiking, climbing and mountaineering in the great Pacific Northwest. She explores nature with a sketchbook in hand, looking for patterns in nature as she explores. Nikki aims to inspire wonder for the outdoors by infusing her landscapes and mountains with energy and movement. Eight and Sand is proud to present a new body of work by returning artist Christopher J Olson. He revisits a familiar theme, science fiction. Colorful landscapes occupied with robots and buildings of the future, this new work explores two opposing forces, natural and man made objects. In addition to art attack night we are hosting a special artist in attendance reception on May 21st. Wittman Estes Architecture is exhibiting “Linescapes”, new work by Jeremy Prim. Linescapes is an exhibition of large scale, minimalist oil and wax paintings inspired by the Pacific coast. Georgetown Trailer Park Mall is excited to present “The Intergalactic Sessions II“, a live improv set performed by some of Seattle’s most talented musicians. Join us for shopping, music and general good vibes. Our many vendors open at 12pm, with the performance beginning at 7pm. Let’s get spaced out together! Georgetown Arts and Cultural Centeris featuring “Melancholia”– mixed media work by Jade Highleyman. Melancholia is a personal investigation of leaving situations “hanging” or being untethered to reality. Generally, in weaving or any needle craft, the person ties up the ends and snips off any excess to present it in it’s finished form. Jade decided to leave the ends un-tasseled, uncut and undivided to creating a golden waterfall of loose ends. Artist studios will be open during ART ATTACK, 6 -9 pm. Georgetown Music Store is hosting Acoustic Armageddon 24 – Spencer Carlson, Kelsey Sprague & TBASA go “Song for Song in theround” during Art Attack 6-9 pm. Always free & all ages. studio e is exhibiting YELLOW: a group show. New work by Brian Beck, Brian Cypher, Carole d’Inverno, Warren Dykeman, Robert Hardgrave, Helen O’Leary, GillianTheobald, Heather Wilcoxon and James Arzente. In celebration of our first 18 months as a new gallery, studio e is presenting a group show, YELLOW, that will highlight work from a group of artists – individual talents whose styles, although varied, exude an ineffable quality of vivid expression that has characterized studio e in the past and will set the tone for our shows in the coming years. Neil Kelly presents Northwest Native Art by Walish Designs and Artist, Jiji Chartraw of the Makah Tribe. Native American drums and paddles featuring Northwest Tribal designs.